Egyptian Finance Minister Mohamed Maeet described the recent new positive outlook of the Egyptian economy by the international ratings agency Moody's as a "positive sign", a statement by Egypt's finance ministry read on Tuesday. In an official statement, Maeet said his ministry is currently following the country's economic and fiscal reforms programme, which began in 2014, in order to sustain the economic growth that was prevalent in the last two years, while also increasing the number of job opportunities and attracting more foreign investments. 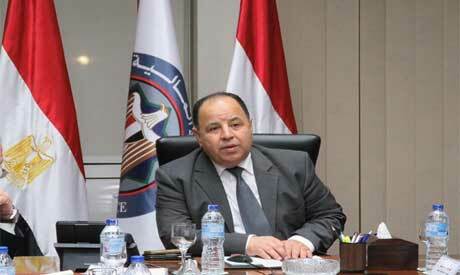 He added that the current rating should raise investors' trust in the Egyptian economy, which will help bring in more foreign direct investments and lower the cost of future loans for the public and private sectors. Moody's has changed the outlook on the government of Egypt's long-term issuer ratings to positive from stable, and has affirmed the B3 issuer ratings in its research document published on Tuesday. "Moody's decision to change the outlook to positive reflects the continuing structural improvements in the fiscal and current account balances, resulting from the ongoing implementation of the home-grown IMF-backed reform program. Moreover, early signs of business environment reforms offer the prospect of a sustainable, inclusive growth path capable of improving competitiveness and absorbing the country's rapidly expanding labor force," the document said. The continued implementation of fiscal and economic reforms should sustain GDP growth converging to six percent, according to the US-based agency. Moreover, Moody's expects that the energy subsidy bill will fall below 1% of GDP by 2020 from 4.1% of GDP in 2017. These savings will be partly offset by cash transfers to low-income and vulnerable households, which should help maintain public support for the ongoing reforms and better direct government subsidies. Since 2014, Egypt has introduced multiple subsidy cuts in fuel and electricity. The decision of the American credit rating agency to affirm Egypt's B3 rating can be traced to its large and diversified economy and robust and rising growth potential that provides a high degree of resilience to external economic shocks and against continuously weak fiscal indicators, specifically debt affordability. "Very weak debt affordability will maintain the government's annual gross financing needs at very high levels of about 30%-40% of GDP," Moody's said. The B3 ratings also capture the low risk of a sudden political uprising that could negatively influence the economic progress through slowing down or reversing the current economic policy. "Foreign and local currency bond and deposit ceilings remain unchanged; the foreign-currency bond ceiling remains at B2, the foreign-currency deposit ceiling at Caa1, and the local-currency bond and deposit ceiling at Ba2," said Moody's. The research document concluded saying that the prospect of upgrading the rating was high if Moody's confidence is heightened in two areas. First, that the government's commitment to fiscal and structural economic reforms will be sustained through fluctuations in the economic environment and public acceptance of ongoing economic policies and second, that the country's susceptibility to external financing shocks will remain manageable.